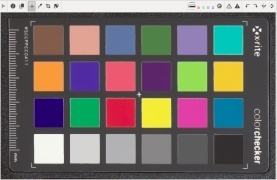 The Image Editor tab in RawTherapee 5.5. The Image Editor tab is where you tweak your photos. By default RawTherapee is in "Single Editor Tab Mode, Vertical Tabs" (SETM) which is more memory-efficient and lets you use the Filmstrip (described below). You can switch to "Multiple Editor Tabs Mode" (METM) by going to "Preferences > General > Layout", however each Editor tab will require a specific amount of RAM relative to the image size and the tools you use, and also the Filmstrip is hidden in this mode, so we recommend you first give SETM a try. The central panel holds a preview of your photo. This preview is generated from the actual raw data by processing it according to the settings either you manually set, or those that are stored in the processing profile used when opening that photo, as specified in "Preferences > Image Processing > Default Processing Profile". The preview will show you the effect of all the adjustments you make. 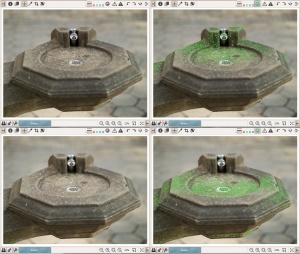 Note that the effects of some tools are only accurately visible when you are zoomed in to 1:1 (100%) or more. These tools are marked in the interface with a "1:1" icon next to the tool's name. The image you see in the preview is taken from the working profile's color space and converted into the monitor profile's color space, if a monitor profile is loaded, or into sRGB if one is not. It does not take into account the "Output Profile" section of the "Color Management" tool. After opening a raw photo you will notice that it looks different, often worse - darker, less sharp, more dull, lacking contrast, more noisy - than your camera's JPEG, or than the same raw photo when viewed in other software. What gives? Witches, aliens, possums, or by design? Your camera does not show you the real raw data when you shoot raw photos. It processes the raw image in many ways before presenting you with the histogram and the preview on your camera's digital display. Even if you set all the processing features your camera's firmware allows you to tweak to their neutral, "0" positions, what you see is still not an unprocessed image. Exactly what gets applied depends on the choices your camera's engineers and management made, but usually this includes a custom tone curve, saturation boost, sharpening and noise reduction. Some cameras, particularly low-end ones and Micro Four-Thirds system, may also apply lens distortion correction to not only fix barrel and pincushion distortion but also to hide severe vignetting problems. Most cameras also underexpose every photo you take by anywhere from -0.3EV to even -1.3EV or more, in order to gain headroom in the highlights. When your camera (or other software) processes the raw file it increases exposure compensation by the same amount, making the brightness appear correct and hoping to recover some highlights in the process. RawTherapee shows you the real raw data which may mean your photos appear dark, so it is up to you whether you apply the required exposure increase and how you go about doing so, whether by using the Exposure Compensation slider or one of the various tone curves. Increasing exposure compensation makes noise more apparent regardless whether it is your camera or RawTherapee which does it, but other than this [b]RawTherapee does not "add noise"! [/b] Many cameras apply noise reduction to the JPEGs (behind your back) to lower the noise level after increasing the exposure compensation, so you should expect there to be a difference between your out-of-camera JPEG and RawTherapee's image if noise reduction in RawTherapee is not enabled. Every DSLR raw file contains a processed JPEG image. Most raw files contain a JPEG image of the same full resolution as your camera can shoot, and some raw files contain as many as three JPEG images differing only in resolution. When you open raw files in other software, what you are usually seeing is not the raw data, but the embedded, processed JPEG image. Examples of software which are either incapable of or which in their default settings do not show you the real raw data: IrfanView, XnView, Gwenview, Geeqie, Eye of GNOME, F-Spot, Shotwell, gThumb, etc. It is worth mentioning at this point that if you shoot in "RAW+JPEG" mode, you are in fact wasting disk space and gaining nothing for it, as your raw files already contain the embedded JPEG files which you can view using the listed programs. The embedded JPEG may differ from an 'external' one as saved using "RAW+JPEG" mode in compression. Most raw development programs (programs which do read the real raw data instead of just reading the embedded JPEG) apply some processing to it, such as a base tone curve, even at their most neutral settings, thereby making it impossible for users to see the real, untouched contents of their raw photos. Adobe Lightroom is an example. Comparing RawTherapee's real neutral image to a quasi-neutral one from these other programs will expose the differences. RawTherapee, on the other hand, is designed to show you the real raw image in the main preview, leaving the way you want this data processed up to you. When you use the "Neutral" processing profile you will see the demosaiced image with camera white balance in your working color space with no other modifications. You can even see the non-demosaiced image by setting the demosaicing option to "None". To provide you with a more aesthetically pleasing starting point, we do ship a collection of processing profiles with RawTherapee. After installing RawTherapee, the default profile for processing raw photos is eponymously called "Default". We also ship the "Default ISO Medium" and "Default ISO High" profiles which are designed to give a good starting point to moderately noisy and very noisy images, respectively. None of the shipped profiles (at least none of the ones shipped in RawTherapee 5.0) are designed to imitate your camera's look. Why not? Every camera is different. My camera's image quality at ISO1600 could be far noisier than your camera's. My camera's response to colors differs from yours. Even the same camera can behave differently at various settings. To provide such profiles, we would need access to raw files for every supported camera model, often multiple raw files in various shooting modes for a single camera, and countless person-hours. This may be possible as a community effort, but it is not a job for a small team. Even then, of what purpose would RawTherapee be if you ended up with a camera JPEG look? It is far more reasonable that you learn how to use the powerful tools that RawTherapee provides to get the most out of your raws, to surpass the camera look. As of September 2015 we are starting to ship DCP input profiles made using DCamProf which include an optional tone curve. This curve is modeled after Adobe Camera Raw's default film curve and renders a result similar to your "camera look". The reason we include the curve in new DCP profiles is because it makes for a good vibrant starting point (as opposed to the flat look of using the "Neutral" processing profile) without having to use Auto Levels and without having to touch any of the other tools, and it is entirely optional. Do read the article on input profiles. If we ship a DCP for your camera model which includes the tone curve, the "Tone curve" checkbox in Color Management > Input Profile > DCP will be clickable. Applying the (Neutral) processing profile will disable the tone curve. While the input color profile is applied at the first stages of the toolchain pipeline, the DCP tone curve is applied later in the pipeline at some point after the Exposure tool. You can create a processing profile ideally tailored to your camera and lens combination, and set RawTherapee to use it by default on your raw photos. See the Creating processing profiles for general use article to learn how. The toolbars above and below the main preview hold a certain number of buttons and other widgets which might not fit on lower resolution screens. If your screen's resolution is too low to fit the whole toolbar, some of the toolbar's contents (buttons, drop-downs, etc.) may become hidden. To see them, simply hover the cursor over the toolbar and use the mouse scroll-wheel to scroll the contents left and right. In addition to the normal preview, RawTherapee supports a number of other preview modes to help you tweak your photos. Preview modes are controlled via buttons in the Editor toolbar or via keyboard shortcuts. Only one preview mode can be engaged at a time. * The preview is returned to normal by deselecting any other mode. The clipped shadow and highlight indicators in the Editor allow you to easily see which areas of the image are too dark or too bright. Highlighted areas are shaded according to the much they transgress the thresholds. The thresholds for these indicators are defined in Preferences > General. The clipped shadow indicator will highlight areas where all three channels fall at or below the specified shadow threshold. The clipped highlight indicator will highlight areas where at least one channel lies at or above the specified highlight threshold. If you want to see only where all channels are clipped, then enable the luminosity preview mode in addition to the clipped highlight indicator. Clipping is calculated using data which depends on the state of the gamut button which you can toggle above the main preview in the Editor tab. When the gamut button is enabled the working profile is used, otherwise the gamma-corrected output profile is used. 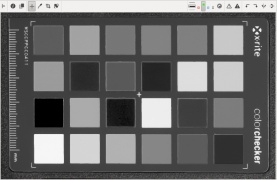 Preview of individual channels may be helpful when editing RGB curves, planning black/white conversion using the channel mixer, evaluating image noise, etc. Luminosity preview is helpful to instantly view the image in black and white without altering development parameters, to see which channel might be clipping or for aesthetic reasons. The focus mask is designed to highlight areas of the image which are in focus. Naturally, focused areas are sharper, so the sharp areas are being highlighted. The focus mask is more accurate on images with a shallow depth of field, low noise and at higher zoom levels.To improve detection accuracy for noisy images evaluate at smaller zoom, around the 10-30% range. Note that the preview is rendered more slowly when the focus mask is enabled. The current implementation analyzes the preview image which is rescaled from the original captured size. This process of rescaling reduces the noise and is helpful to identify truly sharper details rather than noise itself which may also contain micro texture. At the same time, rescaling of the original image to the preview size compresses larger scale details into a smaller size, and it may introduce aliasing artifacts, both of which could lead to false positives. You can increase your confidence by viewing the mask at various zoom levels. It is not always fault proof, but can be helpful in many cases. Warning: Be sure to double-check your images if you decide to delete them based on the focus mask. 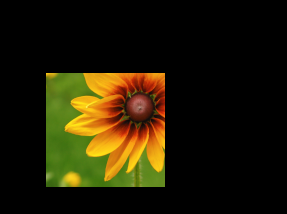 The background color of the preview panel surrounding the image area may be changed to ease image preview during editing and to better visualize image cropping. 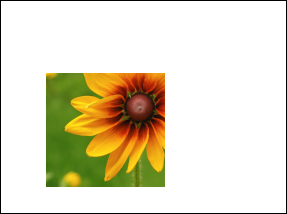 A vertical stack of three thin buttons in the preview modes toolbar above the image preview panel allows to set the background color of the area around the photo preview. Theme-based 8 The cropped area of the image is masked with a theme-based color. The cropped area visibility is based on the crop mask color and transparency as set in "Preferences > Default Theme > Crop mask color/transparency". Black 9 The cropped area of the image is masked with black. White 0 The cropped area of the image is masked with white. The "New detail window" button , situated below the main preview next to the zoom buttons, opens a new viewport over the main preview of an adjustable size and of adjustable zoom. This lets you work on the photo zoomed-to-fit while examining several areas of interest at a 100% zoom (or even more). The benefit of using this feature is particularly important to users with slower machines, though not only them, as the zoomed-out main preview takes a shorter amount of time to update than if you were to zoom it to 100% because working at a zoom level less than 100% excludes certain slow tools, such as Noise Reduction, while the little detail windows zoomed to 100% do include all tools and are fast to update because of their small size. This allows you can use the main preview for your general exposure tweaks where it is necessary to see the whole image, and one or more detail windows to get sharpening and/or noise reduction just right. Changing any tool's parameters sends a signal for the preview image to be updated accordingly. Imagine what would happen if there was no "delay period", and you dragged, for example, the exposure compensation slider from 0.00 to +0.60. A signal would be sent to update the preview for every single change of that value - for +0.01, +0.02, ... +0.59, +0.60. Updating the preview 60 times would be completely unnecessary and actually take longer than it takes you to move the slider. This is especially true for more complicated tools, such as noise reduction, where a preview update can take even a second (depending on your CPU and preview size). The solution is for RawTherapee to wait for a very short period from the moment you stop moving a slider (you don't have to let go of it, pausing movement is enough) until the moment it sends a signal for the preview to be refreshed. This is used for tools with a very fast response time, for example the exposure compensation slider. This is used for tools with a slow response time, for example the CIECAM02 sliders. You can adjust both of these values in the options file in the config folder. 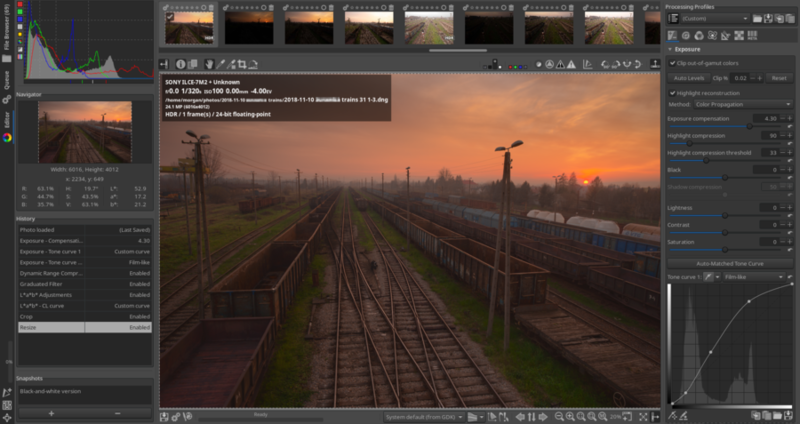 To the left is a panel which optionally shows the main histogram ("Preferences > General > Layout > Histogram in left panel"), and always shows the Navigator, History and Snapshots. You can hide this panel using the hide icon, or its keyboard shortcut. Histogram of the input raw image. We can see there is no clipping in this image and that it is underexposed by a stop. The RGB Indicator points out the position in the histogram of the R, G, B and L values of the pixel your cursor is hovering over. 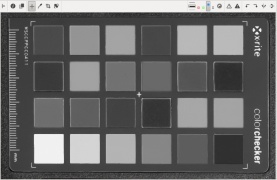 The main histogram can show the histograms of the red , green , blue , CIELab Luminance and Chromaticity channels of the photo as it would look if you saved it. Regardless of the photo's bit depth, the histogram itself has a precision of 256 points. The values the main histogram and Navigator panel show are those of the working profile when the gamut button is enabled, or those of the gamma-corrected output profile when the button is disabled. The clipped shadow and highlight indicators depend on this gamut setting. It can also show the histogram of the raw data as it is in the raw file, before any transformations such as demosaicing are applied to it. Use this information to see whether the raw image is exposed correctly and there it has any clipping. Clipped shadows and highlights cannot be recovered - if it is clipped, the data is simply not there. However, some clipped highlights can be reconstructed using the Color Propagation method. You can show or hide the RGB Indicator Bar , which is situated under the histogram and shows you the exact place on the histogram of the R, G, B and L values of the pixel your cursor is currently hovering over in the main preview. The histogram can be moved to the left/right panel from "Preferences > General > Layout > Histogram in left panel". Linear-linear mode. You find gridlines at halves, quarters, eighths and sixteenths, depending on the size of the histogram. Linear-log mode. The x-axis is linear, the y-axis and the horizontal gridlines are scaled logarithmically. The position of the gridlines still corresponds to the halves, quarters, etc. Log-log mode. Both the x- and y-axes are scaled logarithmically. The gridlines are not scaled logarithmically, but correspond to stops - with every gridline the value doubles, so there are lines for the values 1, 3, 7, 15, 31, 63, and 127 (pow(2.0,i) - 1)). When there is a disproportionately bright area relative to the rest of the image, it will show up as a spike in the histogram. If you want to show this on a histogram with a linear y axis, the spike may push the lesser values down the y-axis, making them difficult to see. Switch to one of the log modes to scale the data and help you get a better overview of all values. 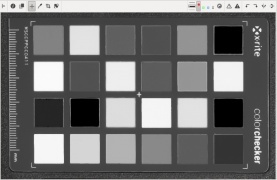 The Navigator panel shows a thumbnail of the currently opened image, and RGB, HSV and Lab values of the pixel your cursor is currently hovering over. The values shown in the main histogram and Navigator panel are either those of the working profile or of the gamma-corrected output profile, depending on the state of the gamut button located in the toolbar above the main preview. When the gamut button is enabled the working profile is used, otherwise the gamma-corrected output profile is used. RawTherapee 5.1 onward can show the real raw photosite values. To see them, set the Navigator to use the [0-255] range, apply the Neutral processing profile, then set the Demosaicing method to "None". The Navigator will show the real raw photosite values after black level subtraction within the range of the original raw data. The History panel contains a stack of entries which reflect each of your image editing actions. By clicking on the entries you can step back and forth through the different stages of your work. An entry is added each time you adjust a different widget - multiple edits to the same widget are stored as one entry. For example, adjusting the exposure compensation slider from "0" to "0.3" and then to "0.6" will result in one entry being stored with a final value of "0.6". Likewise, when adjusting a curve, all individual control point adjustments are grouped into one history entry. Should you wish to store the adjustments as two (or more) history entries, you will have to split them by adjusting some other widget. 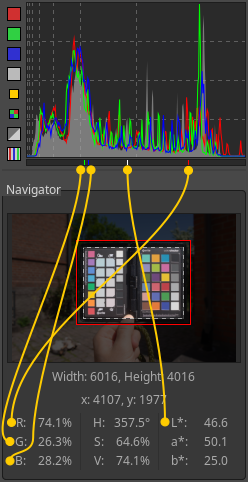 For example, assuming a curve is in "Film-like" mode and you want to keep to that way: adjust several control points on the curve, then toggle the curve mode from "Film-like" to "Standard" and then back to "Film-like" to create a new history entry, and then continue adjusting the curve. The history stack is not saved - it is lost as soon as you close the Editor tab. None of your adjustments are lost though, as the final state of all tools is saved in the sidecar file, ready to be used the next time you open that image. Under the History panel is a panel called Snapshots. Its use is in that you can save a snapshot of the photo with all the adjustments up to that point in time, and then proceed to further modify your photo to give it a different appearance, saving new snapshots at every moment you feel you might have reached a version of your photo worth saving. Once you have two or more snapshots, you can just click on them to flip through the different versions and stick with whichever one you like best. In the future, the snapshots will be saved to the PP3 sidecar file. For now, the history and snapshots are lost when you load a new photo in the Image Editor or close RawTherapee. To the right is a panel which optionally shows the main histogram and Processing Profiles selector ("Preferences > General > Layout > Histogram in left panel"), and always shows the Toolbox. You can hide this panel using the hide icon, or its keyboard shortcut. The Processing Profiles drop-down list lets you apply bundled or custom processing profiles. See the File Paths article for information on where these processing profiles reside on your system. Pay attention to the "Processing profile fill mode" button! When the button is activated and you open a partial profile, the missing values will be replaced with RawTherapee's hard-coded default values. For instance if you apply a partial profile which contains only sharpening settings, all of the remaining tools (such as Exposure, Tone Mapping, Noise Reduction, Resize, etc) will pop into their default positions. If the button is deactivated and you open a partial profile, only those values in the profile will be applied, and the missing ones remain unchanged. For instance if you apply a partial profile which contains only sharpening settings, only those sharpening settings will be applied, and your other tools remain unchanged. The state of this button will make no difference if you apply a full profile, but most of the profiles bundled with RawTherapee are partial (for good reason). The Toolbox, in the right panel, contains all the tools you use to tweak your photos. Each tool has its own RawPedia article. Single Editor Tab Mode (SETM), where you work only on one photo at a time, and each photo is opened in the same Editor tab. There is a horizontal panel called the Filmstrip at the top of the Editor tab showing the rest of the photos in that folder for easy access. There are Previous Image and Next Image buttons in the bottom toolbar (and keyboard shortcuts for them) to switch to the previous/next image. Multiple Editor Tabs Mode (METM), where each photo is opened in its own Editor tab. The Filmstrip is hidden in this mode and there are no previous/next buttons. Having multiple photos opened at the same time requires more RAM. Try both modes and see which one suits you best. To do that, click on the Preferences icon in the bottom-left or top-right corner of the RT window, choose "General > Layout" and set Editor Layout to your preferred choice. Use this Preferences window to select a different language for the user interface, to choose a different color theme, change the font size, etc. It is also possible to start RawTherapee in no-File-Browser-mode (without the File Browser tab) by specifying RawTherapee to open an image from your operating system's file browser (in other words, right-click on a photo and select "Open With > RawTherapee"), or by using the image filename as an argument when starting RawTherapee from the command line (rawtherapee /path/to/some/photo.raw). This mode was introduced for people with little RAM as not having a File Browser tab means RawTherapee uses a little less memory, however in practice the amount of memory saved is little and the usability cost outweighs the little benefit, so it is likely to be removed in the future (see issue 2254). RawTherapee-4.2 showing the Filmstrip with the toolbar visible, which takes up more screen space but lets you easily label, rate and filter the visible thumbnails. RawTherapee-4.2 showing the Filmstrip with the toolbar hidden, which makes it less high and provides more screen space for the main preview (partially visible at the bottom). If you use Single Editor Tab Mode ("Preferences > General > Layout") you can display a horizontal panel above the preview, this is called the Filmstrip. It contains thumbnails of all images in the currently opened album, and is synchronized with the currently opened image so that you can use keyboard shortcuts or the previous and next image buttons to open the previous/next image without needing to go back to the File Browser tab. As of RawTherapee version 4.2.10, you can hide the Filmstrip's toolbar to save screen space. There are two ways of doing this: one way just toggles the toolbar on/off without resizing the filmstrip to the new height, and the other way does the same but also automatically resizes the filmstrip's height. Both are invoked via keyboard shortcuts only. As resizing the filmstrip's height will trigger a refresh of the image preview and this might take a while if using CPU-hungry tools like noise reduction while zoomed in at 100%, the mode that doesn't resize has been implemented for users with slow machines. Users with fast machines will find the auto-resizing mode more helpful. The widgets under the main preview in RawTherapee 5 allow you to apply a monitor color profile to the preview image. This enables users who have calibrated and profiled their monitors to get an instant and accurate preview of their work, whether you're staying in sRGB or working in a wide gamut. Note: OS X users are limited to sRGB and will not get an accurate preview otherwise (see discussion), while users of Linux and Windows will get a correct wide-gamut preview. Go to Preferences > Color Management and point the "Directory containing color profiles" to the folder into which you saved your monitor and printer ICC profile. Restart RawTherapee for the changes to take effect. Now you will be able to select your monitor's color profile in the combo-box under the preview. Use the "Relative Colorimetric" rendering intent unless you have a good reason otherwise. One can also enable soft-proofing of the preview. This will show you what your image will look like once it gets transformed by the printer profile set in Preferences > Color Management. If you want to adjust an image for printing and you have an ICC profile for your printer-paper combination you could set that as your output profile, enable "Black point compensation" in Preferences so that the blackest black in your image will match the blackest black your printer-paper combination is capable of reproducing, then enable soft-proofing. You will see what your image will look like if you print it. This allows you to make adjustments and get an instant preview of the result, saving you time and ink on test prints. The icon with exclamation mark next to the soft-proofing button will gray out areas that cannot be reproduced by your printer, i.e. areas where you will loose details. You should have a calibrated and profiled monitor in order for the soft-proofing preview to be accurate. The items you see in the monitor profile combo-box (under the main preview) and in the printer profile combobox (in Preferences > Color Management) are ICC files located in a folder which you can point RawTherapee to by going to "Preferences > Color Management > Directory containing color profiles". This page was last edited on 1 April 2019, at 10:56.